Just off the coast off the northwest coast of Africa, The Canaries are a part of Spain, so close to Europe but feel so far away! Made up of 14 volcanic islands, of which only 6 are famous for surfing in the Canary Islands. These islands in the Atlantic Ocean are renowned for being shallow, heay and hollow, breaking over reefs. 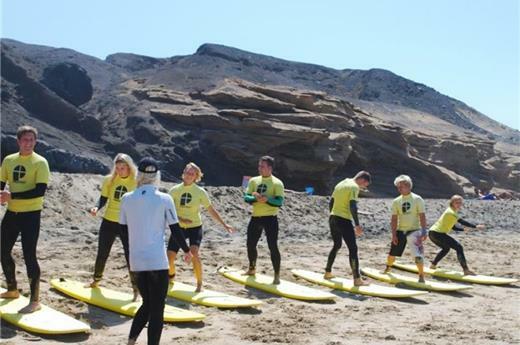 There are more mellow beachbreaks there too for learners, as well as surf camps in the Canary Islands. Lanzarote, Fuerteventura, Tenerife and Gran Canaria are very different however each has dramatic scenery and fantastic waves. Lanzarote has a dry climate and is very much a cross between Mexico and the moon! Although quite localised, if you smile and have respect, you can find some great waves to surf. Fuerteventura is a little more commercialised up north in Correlejo with all kinds of waves for all kinds of surfer. Tenerife and Gran Canaria are perfect for surfers that want to enjoy a bit of nightlife and shopping too. Use the winds and learn to Kitesurf or chill out and take a yoga class – ask your surf tour specialist for details.